“Unlimited” cash for commercial businesses and healthcare providers without creating any new debt.  At MDS Funding, we help commercial businesses and healthcare providers improve their cash flow without creating any new debt. Use your accounts receivable to get immediate working capital. Our focus is helping established and young companies. If your business is restricted from reaching its full potential by conventional bank financing, rapid growth, high leverage, or a short operating history, we will tailor a cash flow solution specific to your needs. If you do business with any government entity, you understand the definition of â€œslow payâ€. With factoringâ€¦get your cash immediately and bid on an unlimited number of contracts. As a healthcare provider, if you are looking to grow your business, bring in new equipment, and/or finance a building, factoring may be your best solution. Sometimes a physician will use factoring as they wind down their practice. Because the fixed costs of running a medical practice (rent, utilities, insurance, etc.) don’t decline as the practice slows down…factoring can also solve these cash flow challenges. Could additional working capital offset current operating expenses? Do you need cash to grow your business or medical practice? Has your business or practice exhausted traditional funding sources? Do you need funds to take advantage of early payment discounts from suppliers? Would an improved cash flow strengthen your balance sheet? If you answered YES to any of the above Questions, factoring is for you. I went to three banks and was turned down by all of them. I began researching alternative financing strategies and that is when I found factoring. My bank called my loan. Luckily for me, my accountant new about a great option â€“ factoring. Within two weeks, the bank was out, the factor was in and my cash flow and profitability started coming back. I thought my customers were going to pay in 30 days. It turns out they are paying me in 60. Factoring is my salvation. Now I am getting the cash I need within 2 days after creating an invoice. Customers were paying me in 35 days. I needed cash immediately. Factoring was the answer. By factoring my receivables, I was able to generate cash flow to continue growing.